Space Invader’s new exhibition opening on 5 October at Lazarides Gallery will be his first London solo exhibition. Space invaders was a video phenomenon of the 1980s, heralding the birth of a new era in both technology and popular culture. 30 years on, French artist Space Invader has filled the streets with pixellated mosaic tiles of his work inspired by the original game, spreading them over the walls of more than 35 of the world’s biggest cities in the last ten years alone. notorious fictional bad boys from the world of Hollywood made with Rubik’s cubes. These striking images are unrecognizable when seen up-close, but the visitor need only to take a step back to come face-to-face with such nightmarish figures as Charles Manson. While Space Invader’s murals illustrate the aggressive nature of our popular culture, they simultaneously critique it by pixellating and therefore distorting the images we encounter in everyday life. His hundreds of unique and individually numbered ‘space invaders’ catch our gaze as we walk by, granting us access to his dynamic and disorientating world. 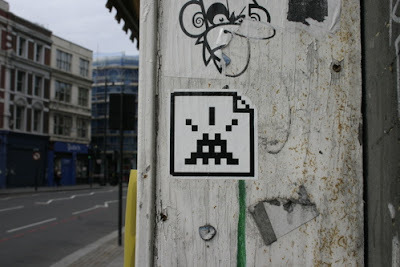 In doing so, Space Invader points to the important transformation of society that information networks have brought about. His pixilated versions of contemporary icons, rendered in the age-old medium of mosaic, forefront the immaterial and transient nature of twenty-first century data. Lazarides Gallery | 8 Greek Street | Soho, London.